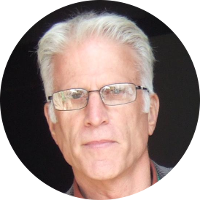 Ted Danson is an American actor best known for his roles on the television shows Cheers, Becker, and CSI. He has won numerous awards including several Golden Globe Awards, Primetime Emmy Awards, and an American Comedy Award. He has also had appearances in a number of motion pictures including a co-starring role in Three Men and a Baby. He is an avid ocean conservation activist and in 2011 he published his first book titled Oceana: Our Endangered Oceans and What We Can Do To Save Them which he co-wrote with journalist Michael D'Orso. Ted Danson is a descendant of at least two Mayflower passengers, John Howland and John Tilley. He also has royal connections that includes King Henry VIII and two of his wives, Anne Boleyn and Jane Seymour. He has a family relationship to the current royal family through a connection to the late Princess Diana and her son Prince William. He also has a kinship to Prince William's wife Catherine Middleton. Ted Danson has a number of family relationships to U.S. Presidents and First Ladies including, but not limited to, Lucretia (Rudolph) Garfield, John Adams, John Quincy Adams, Warren G. Harding, Franklin D. Roosevelt, Edith (Carow) Roosevelt, and Herbert Hoover. He also has a number of connections to fellow actors including Marilyn Monroe, John Wayne, Humphrey Bogart, Katharine Hepburn, Alec Baldwin, and Richard Gere. Bishop's Stortford is a historic market town whose earliest known settlement goes back Roman times when it was a small settlement on the main road from London to Colchester. Although abandoned by the Romans, it later became a Saxon settlement and over the centuries the town's population grew to over 1,000 people by the mid-17th century. However the plague, also known as The Black Death, recurred repeatedly through much of Europe from the 14th to 17th centuries. The plague is estimated to have killed anywhere from 30% to 60% of Europe's population during this time. Bishop's Stortford is known to have fell victim to at least three separate outbreaks of the plague during this time. John Denison of Bishop's Stortford is the 11th great-grandfather of actor Ted Danson. In 1582 the plague broke out in Bishop's Stortford and on December 4, 1582, John Denison died as one of its victims.